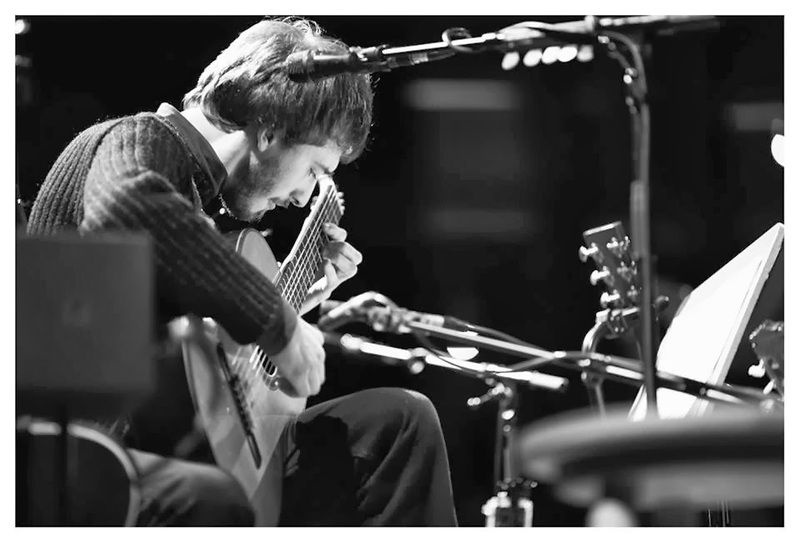 Mircea Gogoncea was the solo guitarist playing at the Tonhalle recently for the historical concerts commemorating the music and musicians that were banned in the exhibition 'Degenerate Music' which took place in the Ehrenhof in Düsseldorf, 75 years ago. 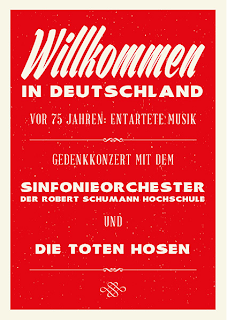 Together with the Symphony Orchestra of the Robert Schumann Music School and the legendary Toten Hosen these three concerts were indeed 'more than a concert' as the city's press officer Natalia Fedossenko commented. The performances could only happen in Düsseldorf - in this constellation, at this very location and with these artists. Those who either chose Düsseldorf, and all its rich musical heritage, to study here; or those who have been part of the local music scene for decades. Together with Germany's biggest rock band, the Toten Hosen, who have been rockin' for over 30 years and who are Düsseldorf 'kids' - the school choir who also sang in these concerts, came from the grammar school that two of the members of the Toten Hosen studied at themselves - and the students of the RSH Symphony Orchestra created remarkable music together, celebrating both the joys of the vibrant music scene of years ago and remembering in a most poignant way, of the tragedies. This was essential viewing for anyone interested in the Düsseldorf, and indeed German music scene, both on a historical and contemporary level. I was so very grateful for the opportunity to be one of the audience, the tickets sold out in a handful of minutes. As I met Mircea after the concert his eyes just beamed and beamed. This exceptional musician has played numerous concerts all over the world, but this experience poured out of every cell as a moment most exceptional in his young, yet all ready astounding musical life. 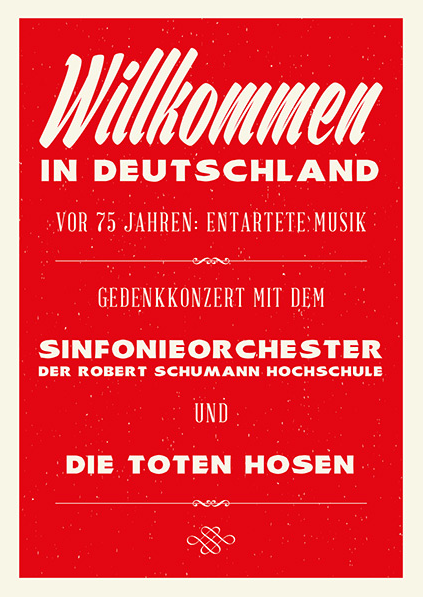 Being part of the “Willkommen in Deutschland” concert series in the Tonhalle Düsseldorf this October has been one of the most exciting, horizon broadening and, above all, fun experiences I have ever had since moving to Germany in 2009! I immediately clicked with the concept – the subtle play on words resulting from the Toten Hosen’s song “Welcome to Germany” and the message of the evening: of tolerance and acceptance as the societal antidote to the very Nazi ideological and practical intolerance against which the concert series has been conceived. As a foreigner in Germany – one who happens to have always felt quite welcome on the shores of the Rhine – this was an especially important point for me. However, playing together with the Toten Hosen on stage, being part of the great show that they put on together with all the other musicians involved, and watching them do what they do best in front of the cheering crowd has been by far the most exciting part of it all. With great pleasure I discovered how superstars of the German punk-rock scene can be such wonderfully approachable, humble, and above all, dedicated and concentrated musicians who are not afraid to try something new and work with others on elaborate and highly demanding concepts! Being on stage with them, in front of the clapping, whistling and constantly cheering crowd, was a truly unforgettable experience! Indeed, as classical musicians, we are used to audiences that generally choose to express their feelings and appreciation differently – and yet the thrill and satisfaction resulting from having members of the public cheer one’s every onstage move is something that can neither be replaced nor fully grasped without having been experienced first-hand. And so I found myself during the last encore of the evening, surrounded by members of the Toten Hosen in the middle of a very sold-out Tonhalle, being carried by the audience’s wonderfully extroverted reaction and the Hosen’s own stage presence, complemented by the sheer force of a full symphony orchestra, smiling over the entire course of the piece of music and above all, enjoying: the fact that I was there, the fact that we were there, that we put on such a show, and that the audience was there to receive it the way they did. It’s been an incredible for this for this skilled young person who is not only a world- class musician, but who is also tackling the world of technology with his pioneering platform - iolma - bringing the possibility of musical education to everyone on the planet and consequently sharing the great gift that only music can bring.